One of our best value mid-range hotels in Banff! The Banff Aspen Lodge combines affordable ski accommodation with warm, friendly hospitality and excellent facilities. All of the guest rooms we offer at the Banff Aspen Lodge are spacious and tastefully decorated. Singles, couples and families can choose the room configuration that suits their needs; most rooms feature private balconies and mountain views. The central courtyard has been recently renovated with 2 large outdoor hot tubs for your enjoyment - perfect after a ski day. There are a variety of room configurations for you to choose from to accommodate singles, couples and families. Every non-smoking room includes satellite TV, clock radio, iron and ironing board, kettle, hair dryer and a coffee maker. 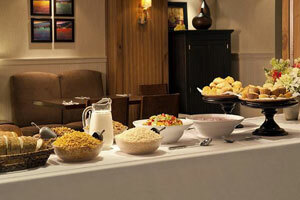 All our guests will receive a FREE continental breakfast at the Banff Aspen Lodge with their stay.